Image from SCP-1931's online auction, uploaded by Mr. ████████. Special Containment Procedures: SCP-1931 is to be kept in a climate-controlled containment vault at Storage Site-41 to protect it from deterioration. In order to prevent the spread of blood-borne disease among personnel, only D-Class personnel may be used in conjunction with SCP-1931's anomalous effects when human testing is necessary. 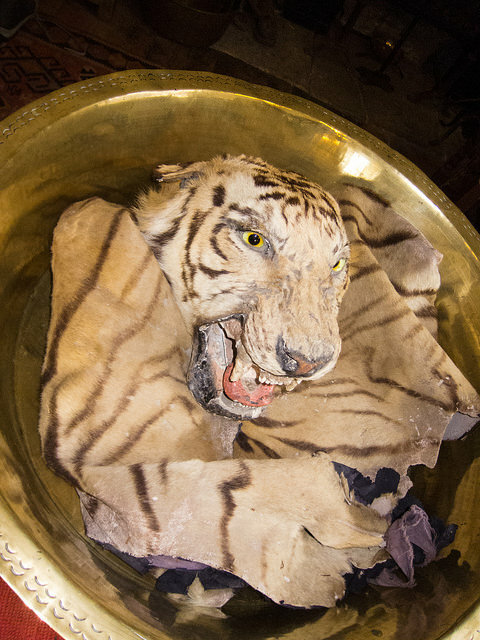 Description: SCP-1931 is the head of an adult female Panthera tigris tigris (Bengal tiger), stuffed and preserved through taxidermy. A number of scars are present on SCP-1931's face, determined to have been inflicted by other animals. The wound at the base of the head has been filled with tar, presumably by the original owner. A small bronze plaque bearing the words "Property of Herman Fuller's Circus Of The Disquieting" is embedded in the tar. Despite its poor condition, SCP-1931 appears to have been restored several times in the past, primarily through the painting of its fur; however, there is no indication that the teeth have been altered in any way since the animal's death. A mechanical hinge has been installed in SCP-1931's jaw, allowing it to open and close freely. Any organism, living or otherwise, that is physically harmed by SCP-1931's fangs will begin to levitate at a height proportional to the severity of the damage inflicted, though the precise proportion seems to vary between cases and has not yet been determined. Preliminary testing has shown that minor wounds typically result in subjects floating between 0.5m and 3m above the ground, whereas severe trauma has resulted in subjects rising to stratospheric heights at speeds in excess of 20km/h. Once suspended at a given height, affected subjects will be able to propel themselves laterally when presented with a given means of thrust. SCP-1931's effects on a subject will cease 30 to 35 hours after initial injury, causing the subject to descend at a rate consistent with natural falls from a given height. Addendum SCP-1931-DOC: Several items were recovered from SCP-1931's grave in addition to its remains. SCP-1931-DOC-A is a transcription of the text found on a promotional illustration bearing the image of a living SCP-1931 pouncing on a young calf. SCP-1931-DOC-B is a series of journal entries pertaining to SCP-1931, selected from the pages of a leather-bound log owned by a Mr. Bernard Crawford. SCP-1931-DOC-C is a document listing the contents of a smaller wooden box buried adjacent to SCP-1931's ossuary. this Saturday at the [REDACTED] County Fairgrounds! Arrive before 5 PM and receive a complementary balloon animal! Jenny gave birth to her first litter of cubs yesterday evening. One of them did not survive, the other three seem healthy. The smallest one, though, still baffles my mind. I went to bed last night certain that I had been dreaming, and yet I have awoken and my dreams persist. In all the years I've spent around tigers, I have never seen or heard of anything remotely similar to this. It is bizarre, and somewhat frightening; however, I choose to see this as an immense blessing. She is unique in all the world, and I have a very strong feeling she will be my ticket to fame and fortune among my peers in the field of entertainment. I have named her Amelia Earhart, in honour of the pilot who made the incredible transatlantic flight two years ago. It seemed fitting, as both seem to possess the gift of flight, so to speak. As soon as she is weaned, I will begin training. Amelia continues to prove exceptionally intelligent and affectionate. Beyond her extraordinary abilities, she has shown herself to be a remarkable performer in general and has consistently outshone both her siblings—and every other tiger I have encountered, for that matter. Crowds have increased substantially at Marco Bros. since I incorporated her into my act, and in turn our salary has improved as well. I am putting much of the extra funds into buying fresh salmon for Amelia, as it appears to be her food of choice and I am told it is good for her coat. My fortune improves by the day. A gentleman by the name of Herman Fuller arrived at my house this morning and invited me to join his travelling circus in America. When I informed him that I was already employed at the Marco Bros. Circus, he offered to pay me four times my current salary and personally cover all my travel expenses. How could I refuse an offer such as that? I have written my resignation letter and shall submit it in the morning. My only concern is how Amelia and the other tigers will handle the overseas travel. It is now our third day here at the Herman Fuller circus. Amelia and her family have already made friends with some of the other animals here. I haven't adjusted quite as quickly; this troupe is astoundingly massive compared to Marco Bros' and the experience has been more than a little overwhelming. Many of the other performers here have bizarre talents that defy all reason; I am not bothered by this per se, but I can't help but feel as though Amelia has gone from being a one-of-a-kind star to simply being just another 'magic animal'. But out of all our problems, the worst is that we are currently positioned two tents away from the Den of Freaks. I am very uncomfortable with this arrangement, but so long as they stay far away from me and my animals, everything should be fine. Still, our experience so far has been largely positive. The general attitude among performers is pleasant and everyone has been very impressed by my animals, especially Amelia. Also, in addition to earning money by performing our act, the Ringmaster had the brilliant suggestion to supplement our income by selling 'balloon animals': stray cats and dogs given the kiss of flight and tied to strings. It's a tad macabre for my tastes, but our patrons seem to love it. My fortune improves by the day. The Ringmaster invented a delightful new finale for our act, involving a number of clowns being gingerly bitten in succession and bouncing off the walls of the bigtop. They're surprisingly good sports about it; I like to think they must still have a fair amount of English blood in their veins. A young boy approached me today and asked what happens to balloons that are released into the air. I told him I didn't know, since saying that they pop and fall to the earth would sound especially unpleasant in this context. Amelia and I have arranged to vacation back in England while Yuri watches over the other tigers. I know that Essex is not exactly her species' homeland, but I feel that she may still enjoy revisiting the place of her birth. I have seen a side to this circus darker than anything beyond my wildest dreams. If I did not sleep surrounded by wild beasts I would surely fear the worst. Once again, the Ringmaster requested that Amelia and I take care of an unwanted party. It was especially windy tonight, and I would be surprised if she hasn't drifted halfway to Sweden by now. I'll admit that it's a messy means of disposal, but at least it's a mess that we don't have to clean up. Our act—ruined! My darling—crippled! And yet not a word of sympathy for either of us. Goddamn freaks! That hellish thing takes off half of Amelia's right leg, and everybody believes the freaks when they say that she made the first move. Everyone's so blasted scared of the man with the upside-down face that they're letting the freaks walk all over us! I've been telling the Ringmaster for years that we should just drop the Den of Freaks and the Freak Parade and stick to acts that require actual skill and intellect. I said it time and time again, and now that damn palm reader is wearing my girl's foot as a trophy! We're all a little strange here, yes, but those creatures aren't even human, least of all that monstrosity. It's bad enough we have to put up with the clowns, now we have to worry about the freaks dropping their facades and hacking off our heads and limbs. It's a bloody shame how downhill things have gone since I first arrived here. I have had it with this confounded place! Any semblance of dignity, decency, and order this circus may have once had is long gone. Monstro-Boy,2 that reeking, foul-mannered, snaggletoothed gremlin had the gall to lay a hand on Amelia, and when I put him in his place, the Ringmaster lashed out at me! I knew the man with the upside-down face's influence was spreading, but I had no idea that even the Ringmaster was under his thumb. I cannot tolerate this lack of professionalism any longer. As soon as I have the wherewithal, I'm taking my animals elsewhere. Plans have changed. Amelia is ill. She picked up some terrible disease from that filthy freak and now she is dying. If I lose her, I swear this shall be my suicide note. I lost Amelia three days ago. I have only now regained enough sobriety to write legibly. I insisted on giving her a good, proper, Christian burial, but the Ringmaster claimed her body as his property. He has had her head preserved and continues to use it to provide the public with his infernal balloon animals. I was only permitted to bury her body. I have no anger or grief now, only a sense of duty. I cannot take my own life and leave the rest of my animals to this damned place. Furthermore, the work that Amelia and I started will continue in her name. It took some time, but justice has finally been dealt. Monstro-Boy has been rightly exposed as the murderer he is. The fact that he did not commit the murders for which he was apprehended is of no consequence to me. The best part is that while his name goes down in ruin, mine remains pure: even those in the circus who are sympathetic to the monster blame his idiot brother Jacob. Not a single heart is turned against me now. Therefore, I have taken this opportunity to take Amelia's head from the curiosity tent and bury it with the rest of her remains. She can finally be at rest. The work is completed and the indignity has ended. My secrets cannot remain safe from the man with the upside-down face for much longer. I apologize that I had to borrow your remaining front paw, but it seemed fitting to complete our work by your hand. My life will soon be over, but at least I will rejoin you and the others in paradise. Let this be a grave for both of us, dearest Amelia. Large down pillow. Object shows obvious signs of decay and heavy damage from a clawed animal. Prosthetic paw made from leather, steel, and wood. Solid rubber ball, heavily deteriorated, although teeth marks belonging to SCP-1931 are still visible. Burlap sack containing the remains of the right halluxes3 of 27 human individuals of varying ages, races, and genders. Sepia-toned photograph of a young boy holding a string tied to the tail of a levitating, decapitated cat. 1. Presumed to be in the possession of SCP-1884-B (see SCP-1931-DOC-B10). 2. Likely a reference to performer David Rosenfeld, currently designated SCP-████. 3. The innermost toe of the foot, or the 'big toe'.